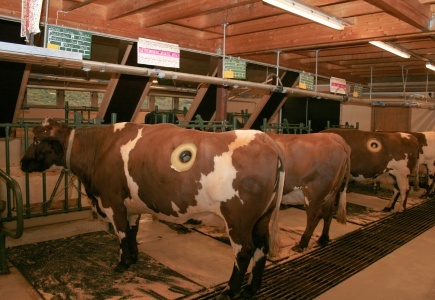 In one of NMBU’s cowsheds, some of the cows are somewhat different: the fistula cows, 12-14 of them. These cows have a fistula made out of rubber – a hole into the rumen which is big enough to allow a person to put her/his hand down it. 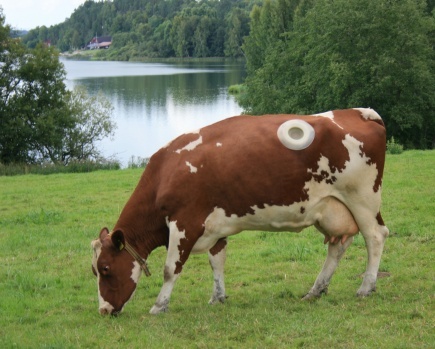 The hole provides researchers and students with a unique opportunity to study processes inside the cow. We have had fistula cows since the beginning of the 1980s. Since then, they have helped optimize feeding, reduce nitrogen emissions, produce milk with more beneficial fat components than ordinary milk, and recently they contribute to research that aims to reduce methane emissions from livestock. Previously, our knowledge on the processes within the rumen was very sketchy. Establishing a fistula into the rumen has given new possibilities. 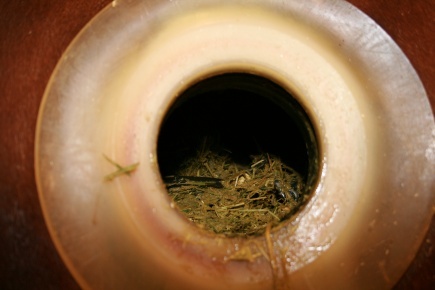 Through this hole, feed samples may be taken out or put in. By regulating what the cow eats and making use of the opportunities provided by the fistula to gather and analyze the “end product” in the form of manure and urine, researchers and students have a unique opportunity to study the conversion of the feedstuffs. 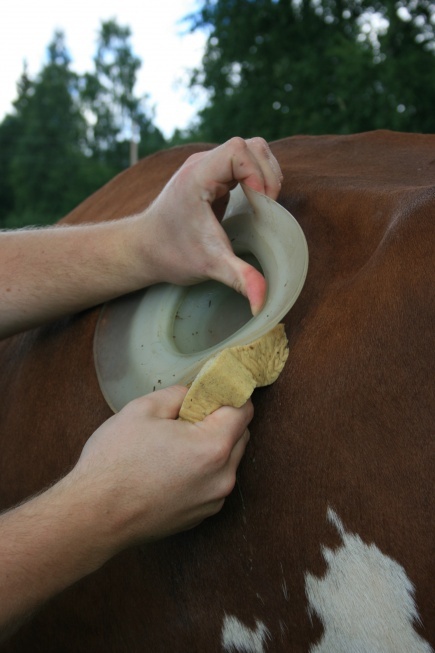 The rumen fistula is made out of a soft rubber material and is equipped with a lid. Is the fistula painful or irritating? 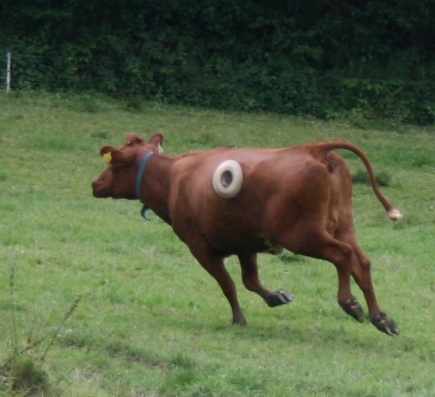 If the cow were to decide, she would surely not choose to have a fistula. During the operation to insert the fistula, the cow is awake and stands on her own four feet. She has been given an injection of sedatives and local anaesthetic, and is in no pain. For the first days after the operation, she is given painkillers. Once the operation wound has healed, the fistula is not noticeably bothersome to the cow. During summer, the fistula cows have a minimum of eight weeks’ ”summer holiday” and join the other “normal” cows in the UMB grazing lands. The fistula cow eats, shits and has calves just like other cows, and she produces normal quantities of milk. The fistula is washed and cared for every day, also while the cows are in the grazing lands. The important question is whether the research that is conducted with the aid of the fistula cows justifies the use of the fistulas. Opinions will naturally vary on this. Due largely to the fistula cows, a new system for protein evaluation for ruminants was introduced some years ago. This has led to significantly more environmentally friendly livestock farming through reducing nitrogen emissions. Based on research using fistula cows, researchers have arrived at a formula for cow feed that produces milk with healthier fat composition. Through the agency of the fistula cows we are able to measure emissions of the greenhouse gas methane and thereby try to establish a feed that is as environmentally friendly as possible.